Summer won't be complete without hitting the beach. The beach will always be one of the best places to complete the summer. Nothing beats in getting the sunkissed glow that you want to achieve and refresh yourself to the ocean breeze. Of course, going to the beach requires you to pick that swimwear that will stand out to the crowd. 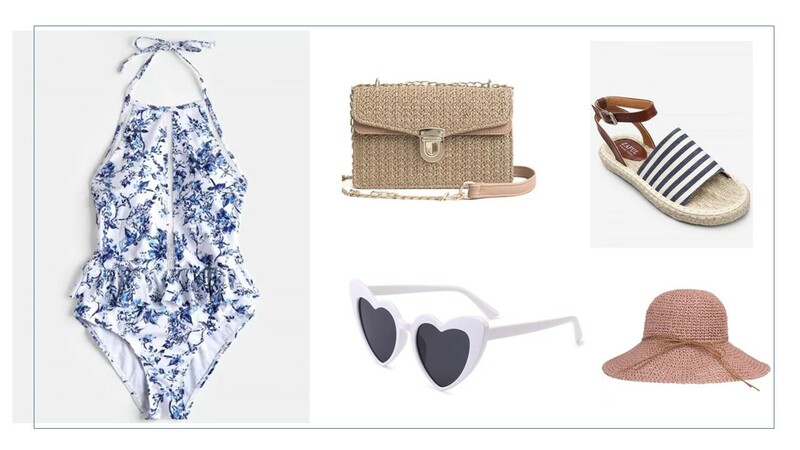 One of the best site to shop your every beach and summer outfit is in Rosegal, and you know guys how much I love shopping on this site. Very affordable and more trendy clothes to choose from. So here is a beach swimwear outfit you can rock at the beach. Hope you like it! These sunglasses is one of the trendiest in Instagram, so it will be a perfect one to wear while protecting your eyes from the UV rays! One of my favorite accessories bringing to the beach is a sun hat, I am obsessed with this hat because you can fold it and throw it on your bag without worrying about ruining the hat. Plus it will save you from that bad hair day. My go-to footwear will be this comfy espadrille that has the ankle strap, a perfect pair for the swimsuit. It will complement the color of the swimsuit too. The bag is a must have and this vintage straw crossbody bag will surely look cute with the whole outfit! You can also put your important belongings and some beach essentials you need to bring. This swimsuit reminds me of Santorini, the blue floral and ruffles detail is what makes the swimsuit stunning. Really perfect for a beach outfit.